The Mobile Banking app lets you make a deposit from your iPhone® or AndroidTM smartphone by taking a picture of the front and back of your check. 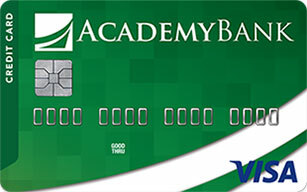 This feature is only available by downloading the Academy Bank mobile app. All devices must have a camera. The minimum requirement for image resolution is 1600 pixels x 1200 pixels. Therefore, the device camera spec must be a minimum of 2mp. Images with lower resolution may pass the image quality verification; however, they may also be rejected more often. Android devices must have autofocus. BlackBerry smartphones are currently not supported. The deposit cut-off time is 7:00 p.m. CT, Monday through Friday. If you submit a deposit after 7:00 p.m. or a non-business day or holiday, your deposit will be processed the next business day. Deposits are subject to verification and not available for immediate withdrawal. Deposit limits and restrictions apply. To learn how to make a deposit using the mobile app, see our How to Make Mobile Deposits (PDF).